When You Motor Away...: REVIEW - Bumbershoot dispatch #3: Big Star tribute "Third"
REVIEW - Bumbershoot dispatch #3: Big Star tribute "Third"
The story behind Big Star's messy and ambitious, sad and brilliant, beloved third record known as both Third and Sister Lovers (a story in itself), is too long to retell here, but you can start with this wiki primer. More importantly, if you don't know Third, do yourself a huge favor and pick it up. It's a must have record for anyone who cares about power pop or the last 40 years of alternative music. And if you somehow have missed Big Star altogether, somewhat understandable given how tragically under the radar their career was, Mike Mills from R.E.M. wrote a fine essay about the band this week for Salon magazine here. And you can watch the recent documentary film Big Star: Nothing Can Hurt Me. 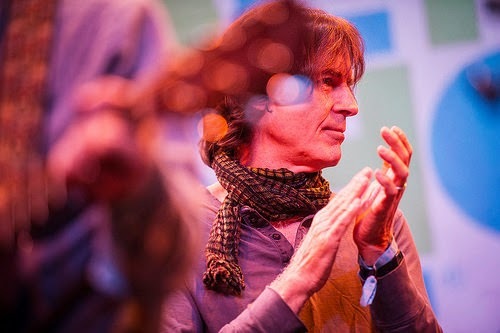 One of our favorite musicians, Chris Stamey (founding member of the similarly under-appreciated power pop heroes the dBs), has painstakingly put together a series of Big Star tribute shows around the world, featuring Jody Stephens, the sole remaining member of the 1970's Memphis quartet, along with a primarily North Carolina-based band assembled by Stamey, augmented with rotating guests. Featuring Third in these tribute shows as was done at Bumbershoot is particularly apt since Stephens was the only band member who worked with Alex Chilton on the record (recorded in 1974), the band falling apart at that point. On this night in Seattle, the list of guests was impressive - along with frequent Big Star tribute members Mitch Easter and Mike Mills, we had Peter Buck, Steve Wynn, Scott McCaughey, local boys Mike McCready and Ken Stringfellow and Jon Auer, and many more. That many contributors could lead to chaos, yet it was a gorgeous set, well organized, deeply moving, and truly perfect in every way. Frankly, this is a difficult review to write because it was a very emotional show, the songs themselves emotional and complex, and the material and experience of playing the songs together so obviously significant to the assembled musicians. Despite all the big name guests, it's Stamey and Stephens who make the thing soar -- Stamey as band leader, conductor, and stage manager, with Stephens as the heart and soul, and proving to be a fine singer himself. They performed Third in its entirety, well assisted by a string quartet of local Seattle classical musicians, plus horns, Mills on bass, Easter on guitar, and the rotating cast coming and going on a variety of electric and string instruments and keyboards, Stamey utilizing and directing their talents well on individual elements of songs (need a mandolin part? well here's Peter Buck!). One of the most powerful things about music is that it hits you where are at the moment. And as I listened to "Thirteen" on Sunday, I found myself suddenly thinking of my twin daughters heading off for their first day of high school this week, the song so capturing the vulnerability and innocence of that age and the fragile first steps towards independence. I ran into Skylar Gudasz hours later while I was walking out of the festival and heading to my hotel, so I introduced myself, telling her that her vocal on "Thirteen" brought me to the verge of tears. If she thought I was some kind of weido, she was kind enough not to let it show and instead graciously thanked me. But it truly was that kind of night. As I looked around the audience during the show, people were so visibly touched by the music, these being such powerful songs so exquisitely performed. "KANGAROO" BIG STAR THIRD from Creato Destructo on Vimeo. After finishing their presentation of Third, they closed with a few choice other classics - the late Alex Chilton's power pop masterpiece "September Gurls" and the late Chris Bell's devastating "I Am the Cosmos". Mike Mills brought a great energy, some rock star presence and the ability to bring the crowd in when he took lead vocals on "September Gurls", as he had early in the show on "Jesus Christ". Here is a directive from WYMA blog: If a Big Star Tribute show put together by Chris Stamey ever appears anywhere near your city, you must attend. It's an unforgettable and magical musical experience.